In the last two weeks my wrist has progressed from a ghastly greyish weeping blistered burn, dramatically swathed in triple antibiotic ooze and enormous white gauze bandages, to the shiny pink of a healing burn, puckered and scarlet like a screaming infant’s face indignantly reminding me of my recklessness, demanding to be cosseted. It’s more sore and tight now than painful, but it is pretty persistent in making its presence known. Hence, in the spirit of circumspection, I’ve been a little wary in the kitchen, mainly cooking things that allow a safe distance from open flame, a gingerness with red-hot cookware, a certain take-no-risk rote cooking. I did bake some lovely cookies. They are different from most cookie recipes I make in that they contain oil instead of butter; this makes them crisp instead of soft and chewy like buttery cookies. But in the face of a looming cholesterol test in the family, I was trying to make a healthier treat that didn’t taste like a “healthy treat” – you know what I mean. But then, I know plenty of people who live with dietary restrictions all the time, whether for religious reason, allergies or health reasons or during pregnancy, so I’m sure I’m not the only one who can appreciate a cookie that doesn’t preach to you about how healthy it is, that is actually good instead of tasting like deprivation. 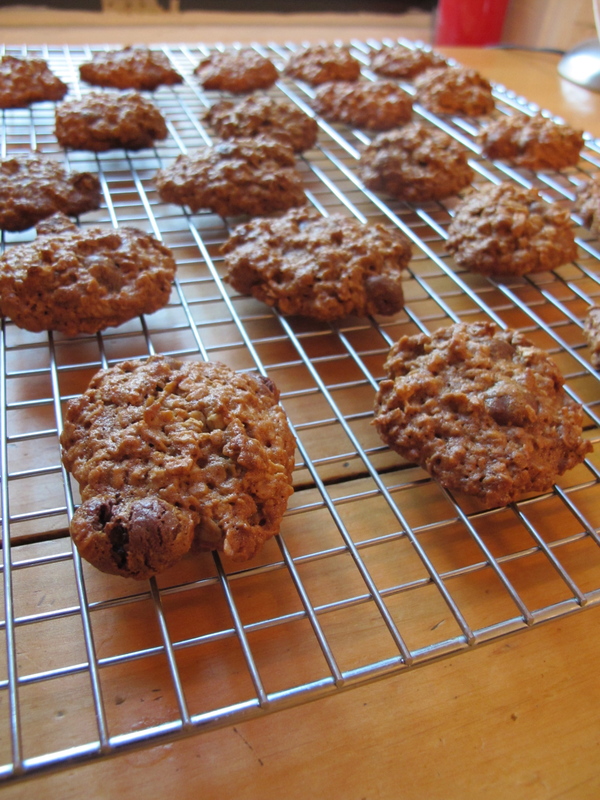 In the first recipe, I used raisins, which were fine, but I had a bag of chocolate covered raisins in my cupboard. Thinking of Mexican hot chocolate infused with cinnamon, they went into the second go-round. It’s just a nice little upgrade, richer, a hint of cinnamon and chocolate with the raisins in a light crunchy oaty bite. Preheat oven to 350°. Cover cookie sheets with either parchment paper or Silpats. 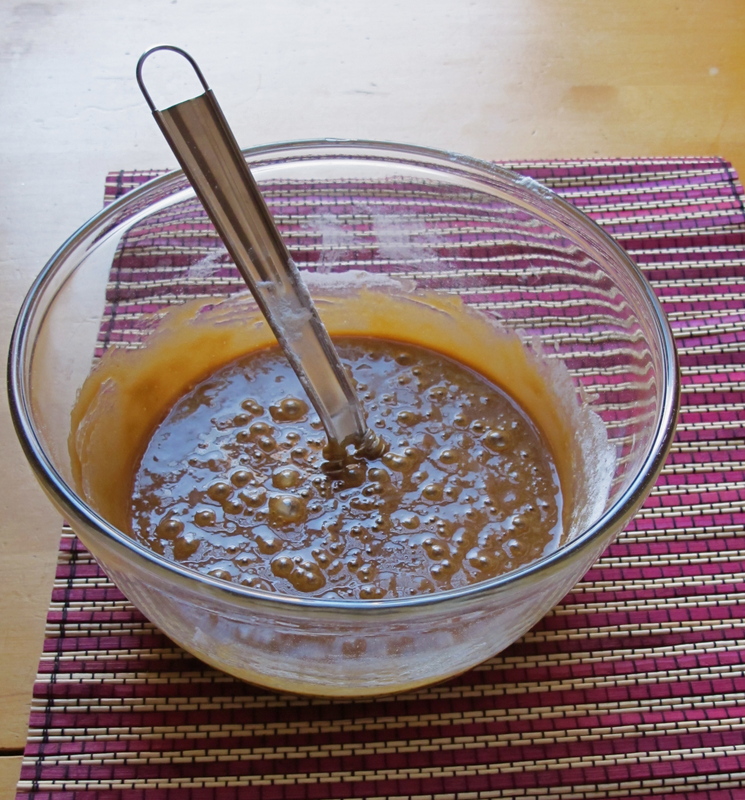 In a large bowl, mix oil, brown sugar, molasses, eggs and vanilla with a whisk. Combine the flour, baking soda, salt, and cinnamon; stir into the sugar and oil mixture. 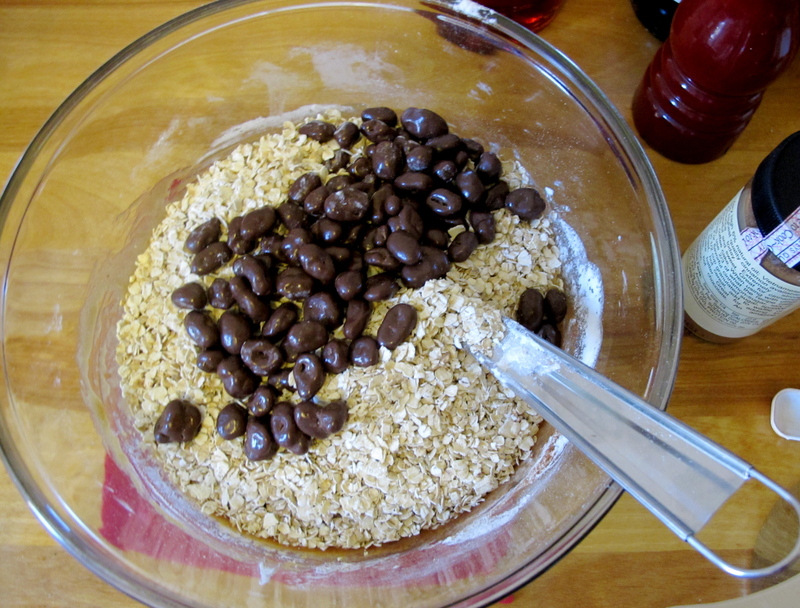 Mix in the oats and chocolate-covered raisins last. it will make a rather dry, sticky dough. 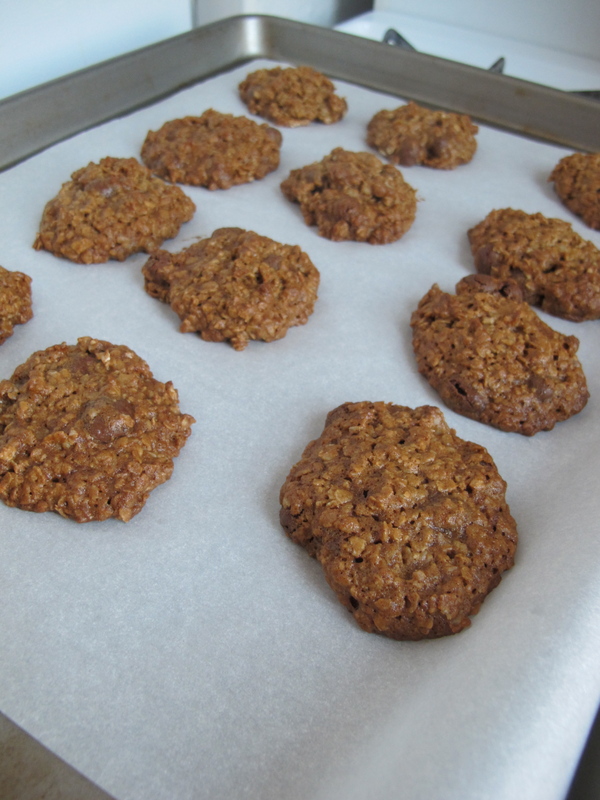 Drop by rounded spoonfuls onto the prepared cookie sheet. The cookies won’t spread much, so they can be fairly close together. I did about 12 per cookie sheet. Bake for 10 to 12 minutes in the preheated oven. Depending on your oven, you may want to rotate the pans or switch shelves midway through. The cookies will still be a little soft on top but the edges should begin to brown a little. Allow cookies to cool on baking sheet for 5 minutes before removing to a wire rack to cool completely. These look good. I have never made any with oil that were good so I want to try making these. What are Silpats? And I like your cooling racks. Mine are long pieces of metal with no crisscrossing so some things fall through. You always make such great photos. Thanks! It is easier to get good shots when there is more light in the kitchen. Silpat is a fiberglass and silicone non stick sheet liner that many bakers use instead of greasing their baking sheets. I have never had anything stick to the one I have, a gift from a cook friend. Parchment paper works very well too, and is less of an investment for the infrequent baker.